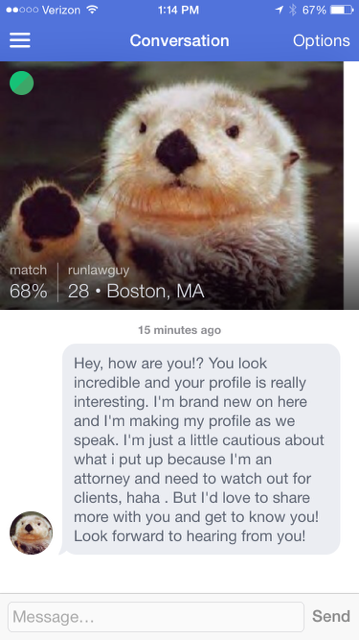 Here’s one more thing I don’t understand about online dating: People who don’t upload photos of themselves. Here’s the issue with that. You have time to search for people and message them, but you don’t have the time to upload a photo? Really? For some reason you’re making me think that you’re actually really gross looking and have no photos of yourself or you’re a 15 year old kid looking to cyber. Either way, no thanks. Okay. Let me just clear something up. You’re online dating not taking part in beastiality. Pretty much every single person (and even maybe some in relationships) has an online dating app on their phone. It is not the 90’s and it is no longer taboo to meet people online. Some guys are even crazy enough to use both excuses in one message – and have the balls to upload a picture anyway. Just to clarify – what were you planning to say on here that would scare away your clients? God forbid you tell the Internet that you enjoy long walks on the beach and candlelight dinners. I’m sure that would really implicate you in a court of law. Speaking of which, would things that your clients have on their online dating profile be held against them to a prosecution? → Does this ever work for you? ← I’m online dating. Lol.